‘Cheerleading around the New Zealand Korea free trade deal fails, yet again, to understand that these agreements are not simply about kiwifruit and wine’, warns Auckland University law professor Jane Kelsey. ‘The investment chapter puts another set of handcuffs on the ability of future governments to regulate in the public interest, and allows Korean investors to enforce their new rights directly against New Zealand in a dubious offshore tribunals’. There is a massive international backlash against this system of investor-state dispute settlement (ISDS). The number of claims and awards of hundreds of millions of dollars have got totally out of control. The panels of judges have no conflicts of interest rules, there is no consistency of rules from case to case, and is no system of appeals. Countries like Germany and France are refusing to agree to ISDS in the mega-agreement being negotiated between the EU and the US. South Africa and Argentina, among other countries, are exiting these obligations where they can and not signing new agreements that contain them. Brazil has never entered into one, and has not suffered from lack of investment as a result. 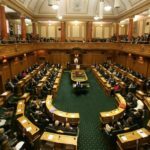 The New Zealand Korea deal is reportedly ‘playing catch-up’ with countries like Australia and Canada, although it has secured a lower level of market access than they did. 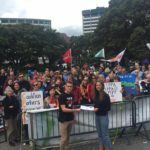 ‘We need to ask why New Zealand is signing up to more ISDS provisions when we are fortunate to have relatively few of them. The answer may lie, once again, in the preoccupation with the agriculture parts of these deals without considering how real the gains are over how long and what trade offs are involved’, Kelsey said. The recent Australia Korea free trade agreement has a similar chapter, while the Australia Japan one did not. The parliamentary record made it clear that Korea insisted on including ISDS, in return for market access, because it already has it in the FTA with the US. Professor Kelsey predicts that ‘the government can expect a similar response in New Zealand, at the same time as people support the New Zealand First Bill that would stop future governments giving foreign investors these powers in future agreements’. 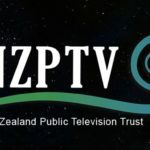 PreviousHow far does GCSB ‘trade team’ spying go?